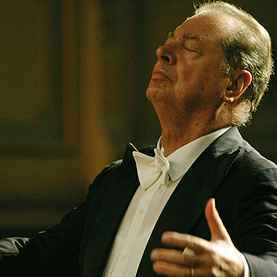 Spanish conductor and composer, born 15 September 1933 in Burgos, Spain, died 11 June 2014 in Pamplona, Spain. - Musical Conductor (Generalmusikdirektor) of Düsseldorfer Symphoniker (1966-1971). - Artistic Director of L'Orchestre Symphonique De Montreal (1974-1976). - Principal conductor of the Yomiuri Nippon Symphony Orchestra of Tokyo (1980-1983), of which he was later named honorary conductor. - Conductor of Wiener Symphoniker (1991-1997). - Music director of Orchester Der Deutschen Oper Berlin (1992-1997). - Music director of Rundfunk-Sinfonieorchester Berlin (1994-2000). - Principal conductor of Orchestra Sinfonica Nazionale Della RAI (2001-2007).